While the HAST Program is focused primarily on children, parents and caregivers are actively encouraged to participate in ways that work for them, both to enhance their own lifestyles and support their children in active and healthy choices for life. Being involved in the HAST Program and taking part in active travel with your children is a simple way to incorporate more physical activity into your day and improve your and your family's health. It's also an opportunity for you to teach your children about road safety and risk assessment, as well as enabling deeper connection and interaction with your children through the shared experience of walking or cycling to school. Need some help to start getting active? Take a look at the Active and Healthy Ipswich Calendar for an activity to get you moving - from aqua-fitness to Zumba, there is something for everyone. Find a safe place to park further away and walk to school to pick up your children - walk back to the car knowing that you’re helping to improve your and your family's health and wellbeing. 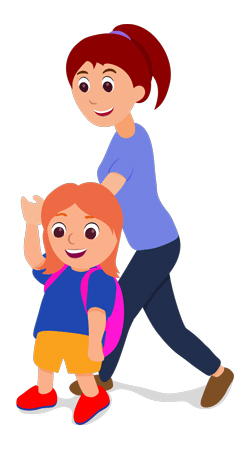 Use the walking time to relax and chat with your children about their school day - or strengthen their connection to their outdoor environment by examining the trees, leaves, bugs and buildings along your route. Suggest simple games or activities to improve your children’s cognitive skills or balance and co-ordination. Encourage them to skip, or take slightly inclined paths that encourage greater physical effort and help build physical and mental strength and stamina. Council assists HAST schools to create and develop specialised 'park and walk maps' showing the safest, most accessible routes to park the car and then walk to and from school. These maps will generally be published in your school newsletter or on its Facebook page and may also be available at the school administration office. Speak to your school and get your copy today! Safety is a crucial element of the HAST Program. Strategies used to encourage greater participation in active travel must first and foremost address safety and security. The HAST Program has partnered with other agencies to provide safety education within participating schools. However, it is the daily supervision and education provided by parents/carers during a child’s primary school years that will always play the most crucial role in teaching children to become competent risk assessors, recognise signs of danger and respond appropriately. Take a look at the factsheets on the HAST Program Resources webpage for some interesting safety facts. If your child’s school is not already part of the HAST Program, encourage the school to find out more about HAST and let them know of the range of resources available for use in the classroom. Don’t forget to get involved yourself - volunteer to help out on an organised ‘walking bus', or start a parents carpooling team.